St. Mark’s has long maintained a commitment to our second mission of purposeful engagement with the greater Dallas area. Each year, students invest thousands of hours in community outreach, from clothing drives and McDonald’s Week to tutoring at neighborhood schools and building Habitat for Humanity homes. The School actively encourages and supports the civic involvement of all students and seeks to strengthen our contributions to the city of Dallas. It is imperative that Marksmen understand they are part of a larger community and play an important role in shaping the future. Today’s students will be tomorrow’s leaders. A. Develop a broad community engagement strategy. Identify opportunities to support greater Dallas city initiatives. Cultivate relationships with academic institutions and other organizations that share a similar commitment to the well-being of Dallas. Review the community service program to explore opportunities to expand its impact. B. Develop curriculum for Upper School students to broaden their understanding of civic engagement and leadership. Design new course offerings that prepare students for public service, civic leadership, and governance. Encourage a regular and healthy public discourse among students regarding public policy issues and solutions. Seek opportunities for students to become engaged in civic activities. C. Explore further opportunities to share St. Mark’s resources with public schools in the greater Dallas community. Review and assess existing and possible DISD after-school programs and summer programs on the St. Mark’s campus. Explore opportunities for greater involvement by St. Mark’s students and faculty in community engagement programs on and off campus. While campus is certainly quieter over the summer, the learning doesn’t stop at 10600 Preston Road. For a few weeks in June, a small team of Upper Schoolers and recent St. Mark’s graduates return to campus, this time standing on the other side of the desk. 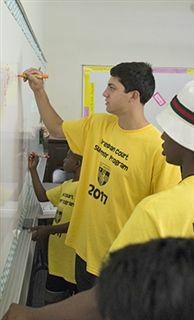 They volunteer as teachers for the Brendan Court ’06 Summer Enrichment Program. 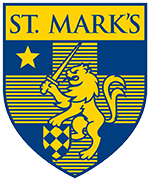 The Program, which was started in memory of a beloved member of the Class of 2006, invites more than 50 DISD students to St. Mark’s for a tuition-free tutorial program. Marksmen gain classroom experience teaching classes to seventh- and eighth-graders in science, math, English, and social studies. Outside of the classroom, students are taken on various field trips, including Jumpstreet indoor trampoline park, The Perot Museum of Nature and Science, and Ripley’s Believe it or Not Wax Museum.